This is the Dead Land, this is Cactus Land: What would Jesus do with the Church? The Catholic Church considers itself to be the church that Jesus founded when he said to Saint Peter “And I say also unto thee, That thou art Peter, and upon this rock I will build my church; and the gates of hell shall not prevail against it.” Pope Benedict XVI is, according to the Church, the heir of Peter, the apostle, fisherman, and first Pope. Depending on religious affiliation, upbringing etc, people consider Jesus to be “God”, a Jewish prophet, a revolutionary or simply a Jewish teacher who lived over 2,000 years ago. But two things are generally accepted, the Catholic Church is firmly based on the Gospels, and Jesus was a spiritually enlightened man who preached love and compassion. As almost all spiritual teachers, Jesus emphasized two things. First, you cannot have a true spiritual life while you are attached to the material world, and love your neighbors, all of them, and pay special attention to the weak and lonely. It is really that simple. Jesus was an enlightened, spiritual teacher who loved life and children. It is frightening to read Luke 18, verse 15-25 and not wonder what Jesus would recommend be done with the Catholic Church as it stands today. “ And they brought unto him also infants, that he would touch them: but when his disciples saw it, they rebuked them. But Jesus called them unto him, and said, Suffer little children to come unto me, and forbid them not: for of such is the kingdom of God. Verily I say unto you, Whosoever shall not receive the kingdom of God as a little child shall in no wise enter therein. So what would Jesus recommend to the Church which is supposedly based on his teachings? An organization that is unbelievably rich, surely into the trillions of dollars and one that has molested thousands of children, mostly adolescent boys? In fairness to the Church, the number of priests who have committed these crimes is somewhere between 1% -5% of all priests, below the 8% for adult men who have had sexual relations with minors. While these arguments are valid indicators that Catholic priests are a little less inclined to molest children that Joe-six-pack, the response to the attacks has been abysmal. And why do the priests tend to target boys? Because the priesthood has become a gay profession. Estimates run anywhere from 10% to 60%, but the real number is surely many times higher than the national average. There is nothing particularly wrong with this, but it should be recognized that gay men eroticize boys more than the average population. While priests maybe in the norm as far as having sexual contact with minors, the fact that 80% of those minors are boys is far outside the norm. There is nothing wrong with the Catholic Church having a disproportionate amount of gays among its clergy. The same can be said for hairdressers and male flight attendants and it brings no scourge to their professions. The problem is when the sexuality of these men is unduly controlled, and it seeps out in criminal molestations of boys. And unfortunately, no matter what the facts are, the Catholic hierarchy has not rooted out all sexual predators with abandon; what should have been done from the beginning, leaving the Church to be branded as a den of child molesters. That association will not go away for a long, long time. Who, nowadays, wants their 13 year old son to become an altar boy? Apart from its massive problems with pedophiles, the Church is sitting on a bundle. Does it really need all the massive trappings? If someone believes truly that Jesus is the Son of God, and believes in the sacraments does it matter where they attend mass? 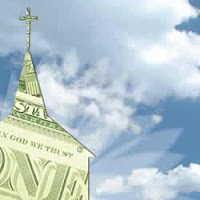 Can anyone imagine Jesus asking people for money to build a cathedral? Alcoholics Anonymous (AA), for example, has little in the way of financial holdings, real estate or money, yet the attendance at their ‘services’ is even higher than that of the Catholic Church. Is there a need for a professional priesthood? The seminaries could train and ordain priests than send them out into the world to do Gods work like real Christians. For those in need of the solitary, contemplative life, the Church could keep many of it monasteries to function as places for contemplation and prayer, and in a way that they could be self supporting and not a strain on society. Imagine the schools, hospitals, and universities that could be built in the poorest corners of the earth with the trillions of dollars locked up in the church real estate, art and financial instruments. Healing, teaching, and educating those people most in need would be the truly Christian thing to do instead of hoarding the money in bank accounts, real estate and art. Imagine how much just the Vatican properties themselves could be worth? How much would the Pieta fetch in a bidding war between the Louvre, the National Gallery, and the Metropolitan Museum? Is there any Christian justification for not selling it? Of course trust funds would need to be set up to pay clergy who can’t find a place in the ‘new’ church and make sure all pensions are secure. But the rest could go to helping the poor, the sick, the hungry and the downtrodden of this world. It would mean a true spiritual renewal for the Church, a realization of its destiny. Enough with a bunch of old men running around in robes hiding the pedophilic scandals of their cohorts and hoarding great fortunes. The Pope should rule the Church as if he were Jesus. Do what Jesus would do. Live with as little as possible, with the poorest and weakest, giving back to them what has been stored in real estate, art and banks for centuries. That would be Christ like, and example to all of what Jesus said and lived.